The play artfully and cleverly handled major world topics on terrorism, the refugee crisis, friendship, lust, and of course, anger. 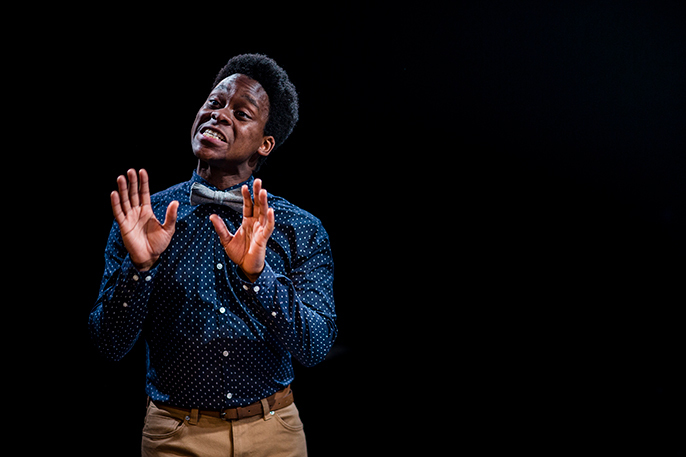 The world premiere of Philip Ridley’s Angry (see listing) is a dynamic, magical, and darkly comedic series of monologues played by Olivier Award nominee Tyrone Huntley (Jesus Christ Superstar, Dreamgirls, Book of Mormon) and Georgie Henley (The Chronicles of Narnia). Six gender-neutral monologues are performed by the characters Him and Her on subjects as diverse as refugees, millennial anger, and interstellar travel. Angry explores the difference between the same experiences from a male and a female perspective. 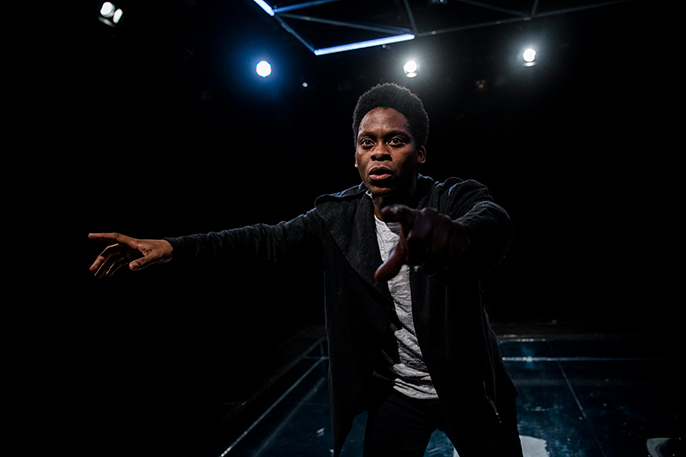 As discussed in my previous interview with Tyrone Huntley here, both actors have had to learn all six monologues as they each perform three every night but also have to alternate the monologues from night to night. This is a production that is at times funny, witty, and crazy, but is also very sad, dark, heart-breaking and serious. The play artfully and cleverly handled major world topics on terrorism, the refugee crisis, friendship, lust, and of course, anger. There are so many wonderful stories in this play that intertwined so perfectly together and left me fully satisfied, it was akin to that feeling that I felt as child when listening to stories being read aloud at story time. I was especially moved by the final monologue named Air. A moving piece which humanises refugees and encouraged the audience to experience how quickly and devastatingly life can change. 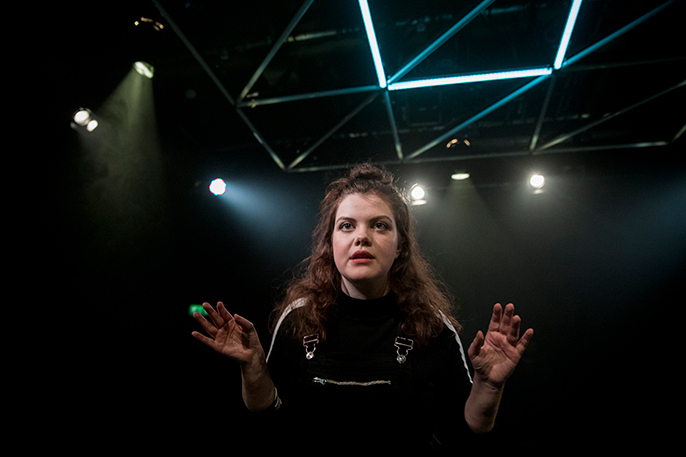 Each character gave me so much to think about and never let my interest or focus stray away from the square and simple set in the Southwark Playhouse. The use of the neon light installation was genius as it worked to display emotion, the weather, stars and nightclubs, a fantastic use of lighting and imagery. Both actors used their theatrical voices and bodies so energetically with such speed and wit the audience could not help but to be transfixed. Director Max Lindsay’s work in this performance is very strong as all of my focus was on Him or Her and I sensed the audience as a whole were transported to the worlds created in each monologue judging by the laughs and audible responses. The storytelling in each monologue was so powerful and illustrative that I could see and almost feel everything they described, the stage literally vibrated with the lingering unease of some experiences as they reflected the difficulty and anger of our times. It is a credit to writer Philip Ridley that each story is so different yet so enthralling. In the production that I saw the character Him followed Her and I was so impressed that I am now going to see the second version Her followed Him. I would encourage you to go see either performance or both as Angry is a great and distinctive play.